97% of first-time users leave an e-commerce store without buying! 85% of these users never add anything to cart. Marketers apply brute force to recover abandoned carts, but few of them know that 42% of revenue is generated from browse abandonment campaigns. Read on to know how you can engage and retarget window shoppers, and ignite the desire to purchase. It was a rainy Sunday afternoon, the greens looked greener from my balcony, everything felt lively and fresh. I was all cozy on my beanbag, sipping hot chocolate and just admiring the beauty that rains can bring. There was a distant barking, must be the milkman's dog, he is after all really scared of thunder. I could hear my neighbor’s radio crackle (yes, she still has a ‘radio’ and the song ‘You can count on me like one two three..’ was playing on it. And then suddenly I was transported to my school days, we used to sing this song a lot- me and my bestie! That’s when I remembered that her birthday was next month! Yesterday while I was leisurely browsing through stores, there was some pretty cool stuff added in the woman’s top category. And I vividly remember a quirky yellow top that I had liked. But I couldn't place the store I had seen it on. So I did what one does at desperate times- frantically started browsing the stores that I remembered I had visited. I kid not, I browsed and browsed, but could not find the top. I cursed under my breath. If only I had put it on my wishlist! If only that website had sent me a reminder! We tell our customers to reach out to users who abandonment a category page or a product page, and today the gravity of the problem we were solving flashed in front of my eyes. Did you know that an average retail e-commerce site visit duration worldwide is 9.4 minutes? But those numbers don't do justice when compared to conversions, does it? Let’s admit it, we all do it once in a while- browse stores, sometimes with no intent of buying whatsoever. As a millennial, I can confirm that just scrolling through the products gives us a thrill. At first glance window shoppers might come across as lazy traffic, but on a closer look, it is actually an opportunity to convert more people if approached with the right tactics. So why wait till they add a product to cart and then retarget? What if you could convert users who abandon a category page or product page? What a blessing that would be! 89.1% users don’t add anything to their cart at the first go. No, I am not saying that you need to stop with the cart recovery campaigns and glue your eyes to the traffic that you receive because let’s face it - people who add to cart show higher intent of purchase. But, not reaching out to the users who abandon a page would be like leaving money on the table. 94% of online shoppers research before making a purchase. Which means that you need to put your best foot forward - engage with them, nudge them to towards a decision to purchase. You might remember times when it was the end of the month and you didn’t want to splurge money. Now that's one reason why users would not be converting. But that doesn't mean that they don't want the product at all! Your job is to make sure that the users are engaged and that they go ahead and covert when they are ready. In e-commerce, browse abandonment means when a user bounces off the website while browsing for products without adding products to cart. Once users visit a category page or a product page, it is important to ensure that they are added to the marketing list - so that you can communicate with them using email, push notifications or display ads. Window shoppers can be targeted and converted into customers by running browse abandonment campaigns. 42%! That is almost half the revenue you are losing out on, without browse abandonment campaigns! And it is crazy that only about 15% are following up with consumers who view a product page and then leave without buying. Engage, retarget and convert window shoppers with Web Push Notifications. Know how! Is there a thing called too much retargeting? You don't want to end up receiving multiple messages for a product that you once saw. Retargeting is all over the place, it’s broken and creating an unpleasant users experience. The solution here is to identify the right users, reach out to them with relevant messaging and trigger the right message. Now that we understand that we need to target window shoppers with browse abandonment campaigns, you need to create micro audience segments on the basis of user’s buying intent. This will help you reach out to the right users with the right messaging. Proximity to the transaction - How far was the user from making the purchase when they abandoned the website. The closer they are - the higher is the intent. Here the goal is to engage the user and bring them back to the store rather than to make them convert. It gives an opportunity to reach out to the users and build brand recall. The goal here is to bring the users back from where they left off. Here you need to nudge them to click on the buy button and convert. Both the segments should ideally receive different communication. The more specific the communication is in a browse abandonment campaign, the better are the chances the user would recall. A Sophisticated approach leads to better results. But the levels of sophistication can keep changing according to different criteria. This is when every message in the browse abandonment campaign that goes out is crafted one by one, manually. This is the least sophisticated way to retarget users, as it takes a lot of effort, time and manual labor. Sometimes it so happens that you don't know what a channel is capable of doing. And sometimes merchants have not head of a particular channel (No, seriously, there have been instances where we have received a blank stare when we talk about web push). The cost-effectiveness of a channel also plays a role especially if you are a new store. Here, merchants can manually send out emails and web push notifications to users in the target segment. To excite users, you can talk about the most bought products, or evoke FOMO. Email sent by Hydro Flask to remind a user about a particular product. With email, you can push out a lot more content - add a detailed description of the products and back it up with visuals. Web push notifications are hard to ignore as it flashes on the screen with all the necessary information. With web push notifications, you can include the image of a particular product (the product that they abandoned or the best-sold product). An attractive headline can be used such as - ‘Did something catch your eye?’. Know all about retargeting using web push in this in-depth guide. Start engaging with your users from day one. Try Web Push Notifications for Free! This is how you can up your ante - reach out to the right users with relevant messages. According to user’s buying behavior, personalize your communication and then reach out to them. You can also automate and send drip messages to keep them engaged and encourage them to convert. Since the messaging is contextual, you need to make sure that the segments you have created and right. Only when you users are segmented according to their browsing behavior i.e. if they have just visited the category page or they have visited a product page as well. Accordingly, you can send them messages that are apt. If a user has visited a category page they can be sent popular products from that very category; for example, the products that are added to wishlist the highest. Other products in the collection that are viewed the most can also be highlighted. Show them the most sold product on the category page that they have visited. A FOMO can be stirred, luring them to make a purchase. If the user has clicked viewed but did not add to cart, personalize the communication by adding visuals such as product image, product name an so on. All these make it easier for the user to recollect what they abandoned. While emails perform well with category browse abandonment, as they have the liberty to showcase a lot of products, push notifications and display ads work best when you specifically have to show a single product and amplify it. This is by far the most effective approach for engaging users who have shown a level of buying intent. One of the best approaches to engage, retarget and also bag some sales. User engagement is all about the right timing and context. For specific actions such as user abandoning category page or user abandoning the homepage - personalized messages are triggered and sent to the user. Here the users are sent targeted personalized messages that are sent at the right time. 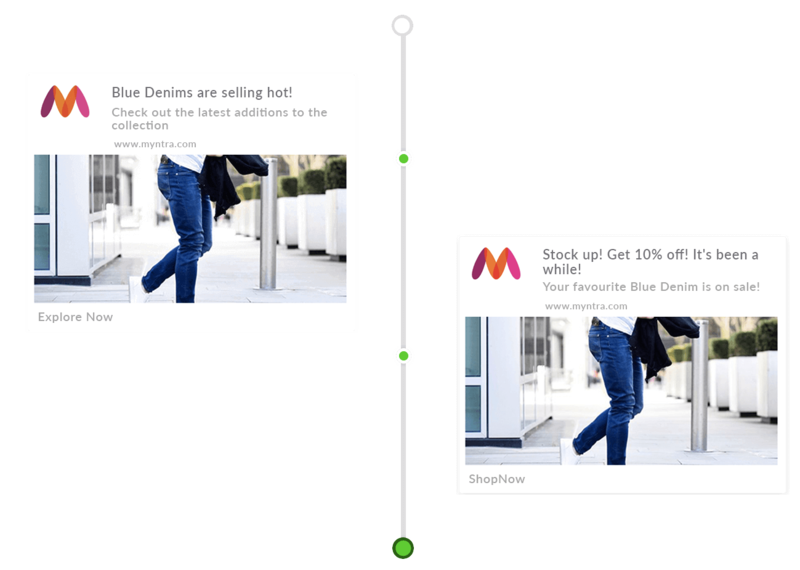 When a user leaves a category page or a product page, reach out to with contextual triggered drip messages. When you target with user specific messages, you are actually catering to one person specifically. Unlike just automating your messages, when a user visits a product page and then leaves, a message is sent keeping in mind the product and time the user abandons the product. For example, imagine I visit a Titan watch product page and abandon the page at 9:00 AM. You visit a product page of a white Nike shoe and leave the store at 9:15 AM. If the first message is set to be sent after half an hour of abandoning the product, then I would receive a message at 9:30 AM and you would receive a message at 9:45 PM. Nurture your users with triggered Web Push Browse Abandonment recovery campaigns. Try it for Free! Keep you messaging subtle. You don't want to come across as a stalker. Reflecting that they are being monitored on every step can actually make them cautious the next time they visit your store. I am not saying that the users should not know that their activities are being tracked (well, that is taken care by the GDPR guidelines) but don't drag them to a point where they would regret giving you the permission. That being said, sending irrelevant content will also put them off, and they might end up not revisiting the store again. The idea is to strike a balance by playing it cool. For example, you can thank them for stopping by, casually remind them if they forgot something, tell them about the new products you have added etc. Not all messages need to be about the product they have abandoned. Even if you got the messaging right, it does not mean that you tail them and constantly keep knocking on their door. It is advisable that you reach out to them 2 times at most. Don't hard sell, if they like what they see, they will make it back to your store with the second communication you send out. Encourage them to revisit and convert by luring them with discounts. You could give them a first-time purchase offer and encourage them to convert. You need not keep the messaging same, the second time you sent it. You could cross-sell the product, glaze it with a small discount and make it look even more appealing. Tell them about the new products you have added to the collection. Lure them back to the site and encourage them to browse and convert. Sometimes users leave a product page if they are unclear about the product. You could reach out to them asking if they need any assistance, ask them if they want a stylist to help them out with pairing it with something else and so on. If you can’t sell them, advise them. You could show what the other users think about the product, the reviews that particular product has got to influence the users into converting. Remember, reaching out to the users with browser abandonment campaign is not just to encourage conversions, but also to engage and lure the user to revisit your website. 79% of user do not convert due to lack of nurturing. 47% make larger purchases than the ones that are not nurtured. And browse abandonment campaigns play a crucial role in engaging and build a bond with the users. Read how you can dig out the fortune at the middle of the funnel and how you can track conversion in this detailed article. 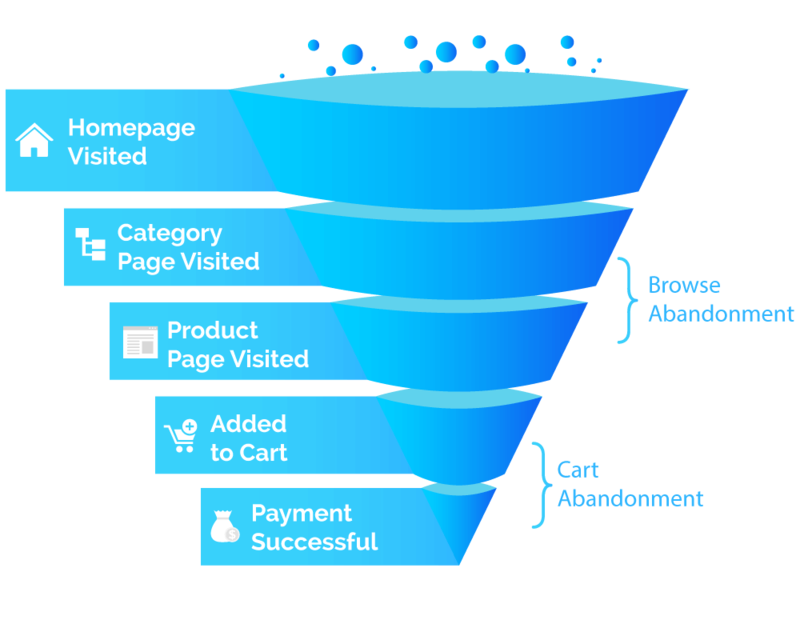 If you can target the middle of the funnel and encourage users to convert before they slip into the ‘cart abandonment phase’ then there is nothing like it!